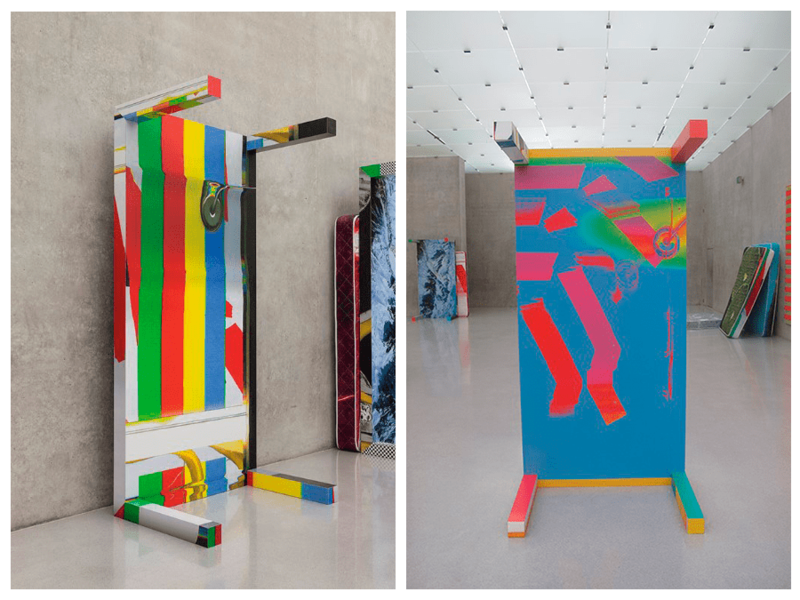 For nearly a decade, the collaborative effort between two high-profile New York artists called Wade Guyton and Kelley Walker delivered a deluge of visual pop and seizure-inducing sculptures that take the form of paint cans, screen-printed canvases, laminated tables, drinking glasses, and even coconuts. As with their own separate, very distinct careers, the men behind this visionary endeavor (founded in 2004), rely heavily on the ink-jet printer and the scanner as a principle engine in the machinery, printing designs that range from sliced fruit and checkerboard patterns to polka dots and kitchen knives. Drawing on the legacy of pop art, Guyton\Walker’s work is characterized by appropriation, analog and digital reproduction, and obsessive repetition. Although each artist works in their own studio, and their collaborative process overlay contemporary visual excess onto traditional artistic concerns of material process and aesthetic investigation. The artistic collective Guyton\Walker, functioning as an autonomous artist, exercises a freedom to extend and interrogate ideas of authorship, production, commodity and distribution. Artworks such as Canstripe_Greenredblueyellow_Table (2012) and Stripe_Venice_Paris_Abstractcanvas80_Table (2012), simultaneously displays, underpins, and calls into question the so-called “artist’s individual hand”. What makes an artistic signature recognizable? How does a signature style come about? Using a contemporary cut-and-paste method of appropriation, Guyton\Walker makes visible the mechanical technologies at work such as flatbed scanning, silk-screening, and inkjet-printing directly onto raw surfaces such as a wooden table –such is the case of Canstripe_Greenredblueyellow_Table (2012) and Stripe_Venice_Paris_Abstractcanvas80_Table (2012) –. Complex patterns, colorful lines, gradients and pools of color are cross-sectioned, warped, sliced, and overlapped as images circulate between media, translating patterns from contents to container, from support to façade. By means of unconventional production techniques, however, the two artists develop highly individual pictorial languages that combine allusions to commerce and advertising culture with liberal quotations from Modernist art. Both Wade Guyton and Kelley Walker make use of different spatial levels and divergent references which play with an impression of spontaneity, chaos, the unfinished. Images and forms migrate and mutate. These components are stacked and reconfigured in a multitude of ways, blurring the line between painting, sculpture and installation in Canstripe_Greenredblueyellow_Table (2012) and Stripe_Venice_Paris_Abstractcanvas80_Table (2012). 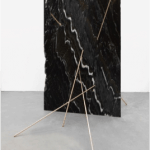 Firstly exhibited at Greene Naftali Gallery, Marc Jancou Contemporary and the Kunsthaus Bregenz in Austria, both artworks are now part of the Adrastus Collection. Wade Guyton was born in 1972 in Hammond, Indiana, and now lives and works in New York. Guyton grew up in Lake City, TN and went on to attend the University of Tennessee and later Hunter College, where he received his MFA in 1998. 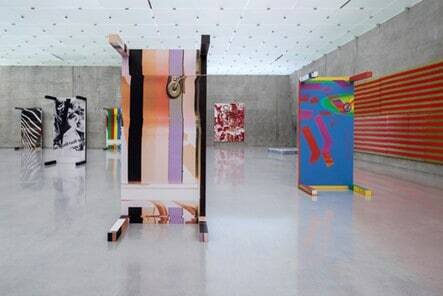 In 2012, Guyton was the subject of a retrospective at the Whitney Museum of Art. Guyton’s works are held in the collections of The Museum of Modern Art in New York, the Centre Georges Pompidou in Paris, the Carnegie Museum of Art in Pittsburgh, the Kunstmuseum Basel, and the Art Institute of Chicago, among others. Kelley Walker was born in 1969 in Columbus, Georgia and lives in New York. Most recently, his work was included in the Greater New York 2005 exhibition at P.S.1 Contemporary Art Center and in the 7th Sharjah Biennial in the United Arab Emirates. Walker also participated at the Whitney Biennial 2006, as well as the Villa Manin Center for Contemporary Art in Passariano, Italy.